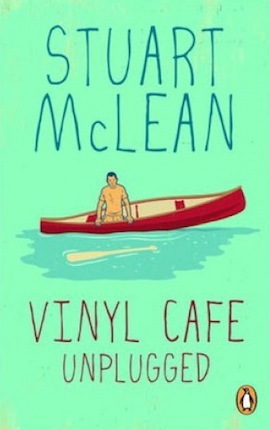 If you read many of Stuart McLean’s Vinyl Cafe short stories in one sitting, the characters become increasingly real and rounded, and a clear picture of their town, friends, family and habits emerges. You can also see how McLean’s style has changed over the past twelve years. It has become looser, perhaps more philosophical, occasionally more sentimental. Notwithstanding all that, his technique has remained form perfect. McLean has said that his stories are as close as dammit to his actual life, and if that is the case, you can see the life stages that he has gone through – children grow up, the dog gets old and dies, he feels age creeping up on him. But in 2000, he was still sharp, witty and perky. “Arthur” is a fine observation of an endearing, potato-stealing dog, and “Galway”, of an almost- toilet-trained, belligerent cat. They are hilarious – there has to be readers out there who have tried in vain to train their pets, and have given up because Cesar Milan wasn’t available. All thoughts of “calm, assertive pack leaders” went straight out the window with these creatures. “Galway was standing on the window ledge flicking her tail at the moon. Jim and Brenda looked at the cat and then back at each other. Still they hadn’t said a word. It was Jim, who comes from the Annapolis Valley, who spoke first. ‘Nice night,’ he said.” Dave, the main character in most of the stories, has a couple of hangups, one of them being obsessive thoughts that get him into very entertaining difficulties (like in “Fly”), and the state of his feet (“Harrison Ford’s Toes”). 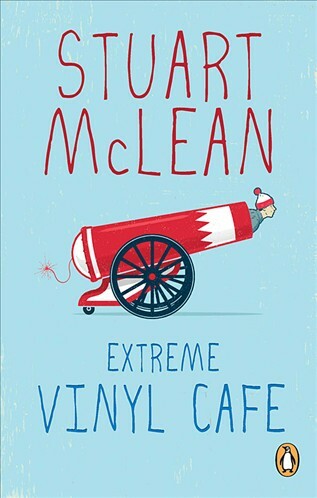 McLean also drops regular references to bands and musicians into the stories – Dave does, after all, own a record store – and Geechie Wiley in “The Last Kind Word Blues” tempted me to Google the song – as a result, I’ve discovered many artists of whom I’d never heard until I’d read Stuart McLean. Perhaps intention was so share his sense of nostalgia. ”The Bare Truth” is so skin-crawlingly discomforting, I literally had to skip pages to get through it. I know that is the kind of terribly awkward social situation people get into, but in it, McLean’s usually entertaining situational comedy slipped over into cringe comedy in the style of “Good God” and “Curb Your Enthusiasm”. ”Figs” is probably the most tender of the stories, about Dave’s ageing neighbours, Eugene and Maria. Dave worries about whether they can cope by themselves in their old age – like all children do about their parents, and he considers the enduring nature of love, which is also the subject of “Love Never Ends”. In this, the last story in the book, he writes about the small but significant things people do when they have loved each other a long time, like keeping a chocolate bar in the bedside drawer as a make-peace snack so they wouldn’t go to sleep mad at each other. McLean has a very keen eye for the minutiae of daily life and relationships, and is able to elevate them into profound philosophical arguments. He does so very plainly, simply and elegantly. He specialises in the laconic one-liner, often only a few words, but words that make highly satisfying endings. Each story is prefaced by a letter from a Vinyl Cafe listener or fan, with a response from McLean leading in to the story. The French influence is strong in this collection (Canada is after all, bilingual in places), particularly in “Petit Lac Noir” and “A trip to Quebec”. It’s proof of McLean’s descriptive powers that I understood the stories and got the punch-lines even though I don’t understand French. All the stories were a joy to read, tightly structured, simple, yet expressive, but I had to read “The Waterslide” a few times simply because the ending was so delightful. Dave’s old neighbour, Eugene, helps the kids build a waterslide and then cannot resist going down it himself, and for a moment, becomes a kid again. This is a recurring theme in this collection; recalling and trying to relive the best moments of childhood, for instance in “The Cruise”, “Rat-A-Tat-tat” and “Dave and the Roller Coaster”. Every story has been lovingly and carefully crafted and is a joy to read. McLean had described these exact same situation in “Vinyl Cafe Unplugged”, but this time, as the title suggests, Arthur’s doggy habits have taken on significance of an entirely different dimension, and the family mourns as if for a king – even placing an offering (a potato) on Arthur’s vacated throne, his basket. This story is one of the sad ones in the collection, along with fewer stories written to get a chuckle from the reader, and more to get the reader to pause and consider. Two stories, “Hello, Monster”, “Tour de Dave” and “Attack of the Treadmill” are on the familiar theme of accident-prone, clumsy Dave getting himself into unimaginable difficulties, and despite the fact that the reader can see disaster coming a mile away, they are still funny. But many more are observances of the small things that make life worthwhile, quiet, simple stories about memories, traditions, private pleasures.